By the end of March, Twitter plans to push ads into its users’ Twitter streams.The company is already warning potential advertisers that users are probably going to hate them. Armed with a PowerPoint and Webinar software, Twitter is out pitching these ads, officially called “promoted tweets,” to agencies and other ad-buyers right now. Peter Kafka landed a copy of the pitch. The most interesting part is the part at the end, where Twitter warns potential advertisers that the new ad units are probably going to tick users off. To its credit, Twitter is right. Users probably will hate the ads at first. To its further credit, Twitter is pressing on anyway. 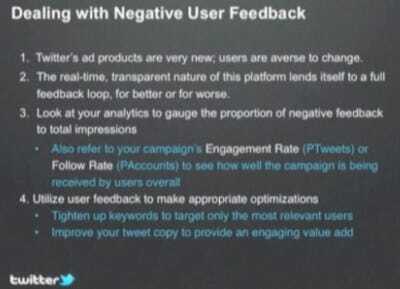 Twitter is also smart to tell advertisers that this negative feedback isn’t a bad thing. Their message: If enough users hate a sponsored Tweet, the advertiser should listen up and change it.